On the evening of December 5, children across the world will set out their shoes hoping that on the morning of December 6, they will awake to find them full of treats from Saint Nicholas. But in many parts of Europe, Saint Nicholas Eve is also known as Krampusnacht, a night when Saint Nicholas's wild companion, the Krampus, roams the street looking to punish the wicked. And so in the spirit of previous holiday comics such as The Klaubauf's Wager, Tio de Nadal, and The Baker's Dozen, we at Comics Alliance are happy to present a brand new original comic by Benito Cereno and Chuck Knigge; a surprisingly historical tale of Krampusnacht. As a quick content warning, this story does include a little more violence and blood than the traditional Christmas tale. Additionally, as a story set in Austria during World War II, some Nazi iconography is included. Making appearances on television, in comics, and in a surprising number of movies, the Krampus has become an increasingly accepted (and in my opinion, misunderstood) element of American Christmas culture. Even setting aside the fact that he's a figure associated with the related-but-discrete holiday of Saint Nicholas Day, and not the more-popular-in-America Christmas, the American tendency to frame the Krampus as the villain of Christmas belies his history as not a threat to the innocent, but instead a dispenser of retributive justice. The origins of the Krampus lie in pre-Christian beliefs in tutelary forest spirits in Alpine Europe, and it is in the regions of Central Europe that the Krampus (and similar figures such as Klaubauf, Hans Trapp, Bartel, the Perchten, and so on) is still most vigorously celebrated. But this wasn't always so. 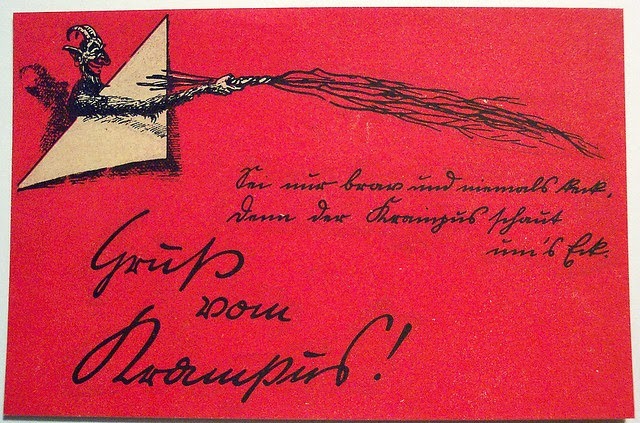 In fact, celebration of the Krampus and his night was banned in his home of Austria from the 1930s until at least the 1950s by various far right political parties such as the Fatherland Front, the Christian Social Party and, of course, the Nazis. It was not until the end of the 20th century that popular celebration of the Wild Man of Saint Nicholas resumed, which has continued --- and indeed, grown --- to this day. I like to imagine that this comic is an accurate representation of how the Krampus spent his time in the years that he was a persona non grata in his own country. If he couldn't help reward the good, he would at least focus on what he does best: punishing the wickedest of the wicked. And so if you happen to see the Krampus out on his runs tonight, maybe share with him his customary glass of schnapps, and reflect on how this Christmas, we might just need a fascist-eating demigod on our side.